The most illustrious temple in Myanmar - the golden-spired Ananda Pahto. How to see Myanmar without breaking the budget. The temple remains of a 9th century city sprawled over 104km2, Bagan is one of Asia’s most beguiling sites. The Thande Hotel (+95 616 0315; doubles from $28) in Nyaung U, the small village on the outskirts of the archaeological park, has 37 rooms with timber floors, TVs, bathtubs and decks huddled around a swimming pool. The Hotel @ Tharabar Gate (rooms from $72) has a spa and 84 sumptuous rooms armed with all the mod-cons scattered around a private garden. Situated in Old Bagan, the hotel is a stone’s throw from the temples. Hire a horse and cart to explore the temples. The most illustrious include the golden-spired Ananda Pahto with its four standing Buddhas, and Shwesandaw Paya, which offers spellbinding sunsets from its upper levels. In between, leave the beaten trail for lesser-explored temples where the only people you’re likely to meet are goat herders. Rising from the flat dusty plains 50km southeast of Bagan, Mount Popa is an extinct volcano believed to be inhabited by nats – or spirits. 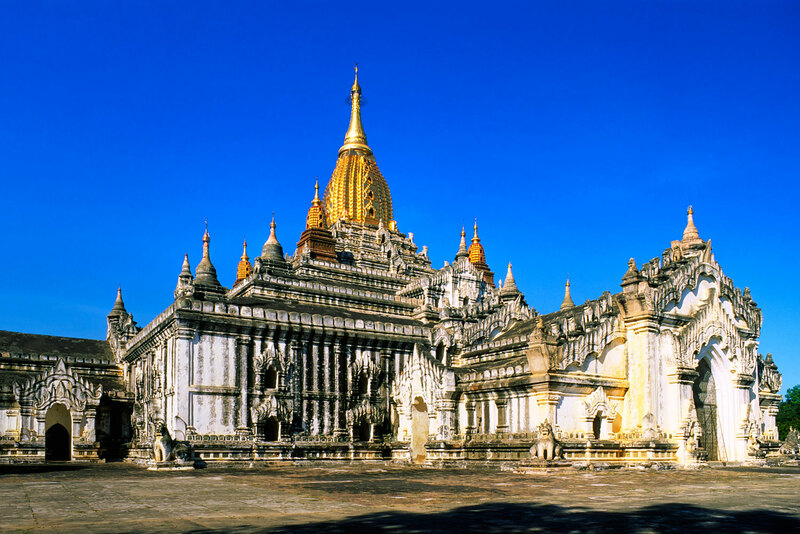 It is Burma’s mystical hot spot and has been a site of worship for over a millennium. Climb the 777 steps to temple Taung Kalat the traditional way – without shoes. The Moon vegetarian restaurant (North of Ananda temple, Old Bagan; +95 6160 481), set in a garden in old Bagan just north of Ananda Pahto, is a good stop mid temple touring. Order the guacamole with poppadoms, pumpkin soup with ginger and the eggplant salad. A nod to Burma’s Indian population, who arrived here during the British era, Aroma 2 (Restaurant row, Nyaung U) has good Tamil-style thalis with dahl, rice and curry. Before dinner, go for beers at Beach Bar and Restaurant (No.12, Youne Tan Yat, 4 Quater, Nyaung U; +95 616 0126), a wooden bungalow perched on the edge of the Ayeyarwaddy River. Long off the beaten track, Burma’s stunning coastline is now slowly opening to tourists. Ngapali – an idyllic 10km stretch of sand lined with coconut palms – is the most accessible. Located in Lintha village, a small bay north of Ngapali Beach, Yoma Cherry Lodge (yomacherrylodge.com; doubles from $50, including airport transfers) has a big beachside terrace, plus wooden and thatch rooms with water or garden views. A few steps upmarket, Pleasant View Resort (pvrngapali.com; doubles from $105, including airport transfers) flanks the edge of another fishing village. Twenty-six spacious and well-equipped bungalows open onto the beach; the electricity is turned off from 7am to 2pm. Prices here are directly from the hotels; travel agents in Yangon offer the best deals for Ngapali. Hire a long-tail boat and go snorkelling off Pearl Island, a picturesque isle just a few kilometres off the coast. Alternatively, Asia Whale (ngapaliwatersport.com; from $85 per person) organises snorkelling, scuba diving, fishing and kayaking trips off Ngapali with a few more frills – like cold drinks, snacks and all-important life jackets for the more safety conscious traveller. In the evenings, head to the fishing village at the southern end of Ngapali Beach to watch the tug-like wooden boats pull their anchors and sail off into the sunset. Pleasant View Islet BBQ Restaurant (+95 434 2224; pvrngapali.com) presides over a rocky islet off the beach; you may have to wade through water to reach it at high tide, but it’s well worth the effort. The prices are relatively high for this neck of the woods, but the views are superb and it’s a top spot for cocktail o’clock. Moonlight Restaurant (Ngapali Rd) near the Sandoway Resort offers a bounty of freshly caught seafood dishes like coconut curry prawns, grilled snapper and fish tempura. This tranquil body of water ringed by mountains deep in Burma’s Shan State has walking trails, stilted wooden villages and hidden Buddhist temples. Next to the main pagoda in Nyaungshwe village, the friendly but eccentric Mingalar Inn (doubles from $18) has spacious rooms in a garden setting. Book one with a veranda, and shower early if you like hot water. Golden Island Cottages (doubles from $100), owned and run by an ethnic Pa’O cooperative, has stilted bamboo bungalows in both Thale-U village and Nampan village; each with private balconies with lake views. On the outskirts of Nyaungshwe, newly built ViewPoint Eco-Lodge (doubles from $70) has 20 stilted cottage suites built in the traditional Shan way, with local limestone, mud and rice straw. Inle Lake is home to fishermen who use a unique one-legged paddle while dipping their nets into the water. Arrange for a boat to pick you up at dawn so that you can watch them at work while the sun rises over the surrounding peaks and washes the lake a peachy shade of pink. While there, visit the Ywama floating market, a bustling local bazaar that springs to life every five days. You can also stop by the floating flower gardens and Nga Phe Kyaung Monastery, where the monks have trained the resident cats to jump through hoops. Find a good map and trek to the Koun Soun Taungbo Monastery, stopping off en route to observe life for the local hill tribes. Sleek “Shan nouvelle cuisine” is served degustation-style at the ViewPoint Eco-Lodge, with views over the surrounding paddy fields. The 12-course meal has, unfortunately, been tweaked for foreign palates, but is a steal for $18. More authentic is the tasty kauq-sweh – noodle soup – that locals devour for breakfast each day. The Mingala Market in Nyaungshwe has the best. If you’re tired of curry and rice, Golden Kite (Yone Gyi and Myawaddy Rd; +95 812 9327) in Nyaungshwe has wood-fired pizzas and homemade pasta using imported ingredients.